Located in Thomas Paine Plaza, across the street from City Hall, Hank Willis Thomas’s All Power to All People was a public art intervention that dealt with racial identity and representation in Philadelphia. 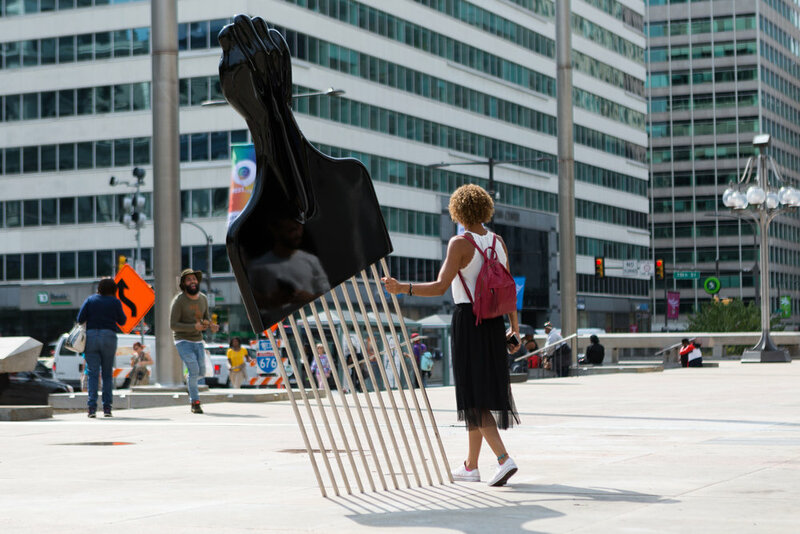 The artist’s Afro pick sculpture, standing eight feet tall and weighing close to eight hundred pounds, was installed not far from pop artist Claes Oldenburg’s monumental Clothespin and Paint Torch, Jacques Lipchitz’s Government of the People, and Zenos Frudakis’s statue of former mayor Frank Rizzo. 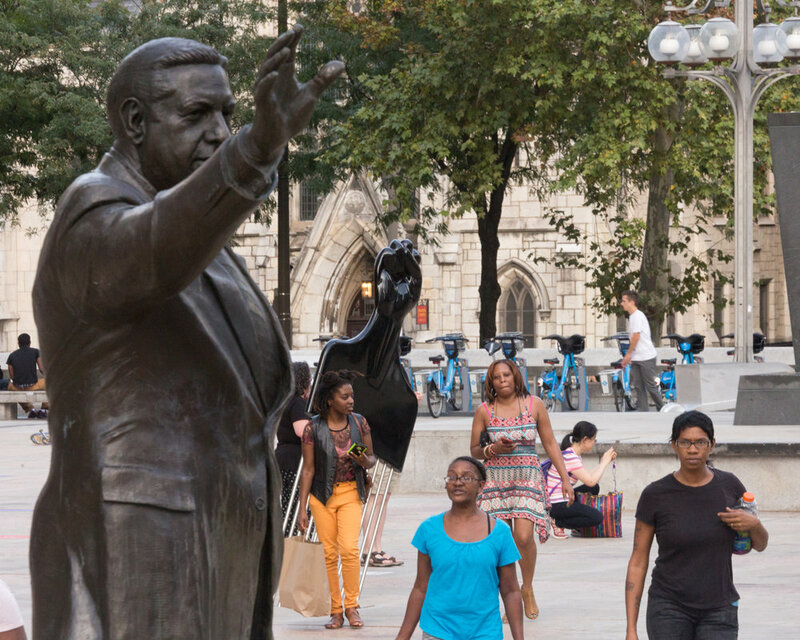 Installed the same month as the city’s Octavius Catto statue (the first monument in Philadelphia dedicated to a historic person of color on public land), and amid public debates about the Frank Rizzo statue, Willis’s temporary monument prompted conversations about equal justice and civic belonging. Thomas has deep family connections to Philadelphia, including his maternal grandmother, Ruth, who was a beautician in North Philadelphia; his mother, Deborah, a celebrated archivist and professor of African American photography; and his father, Hank, a jazz musician and former Black Panther. The artwork’s name derives from a rallying call popularized in speeches by Black Panther Party activist Fred Hampton, who was later murdered in a raid by local and federal authorities in Chicago. All Power to All People was recognized by the Americans for the Arts’ Public Art Network Year in Review as one of the top 50 outstanding public art projects from across the country in 2017. Partners: Mural Arts Philadelphia, The City of Philadelphia and the Department of Public Property. All Power to All People was presented as a part of the Monument Lab: Philadelphia (2017) exhibition. This sculpture is an enlarged Afro pick with a power fist cast in aluminum and spray coated in high gloss black with stainless steel teeth. It is approximately eight feet tall and will be supported by a base (not visible above ground) at a slight tilt. The piece should not weigh more than 800 pounds. The origin of the Afro pick dates back to the time of ancient Egyptians as an article of status and cultural belonging. 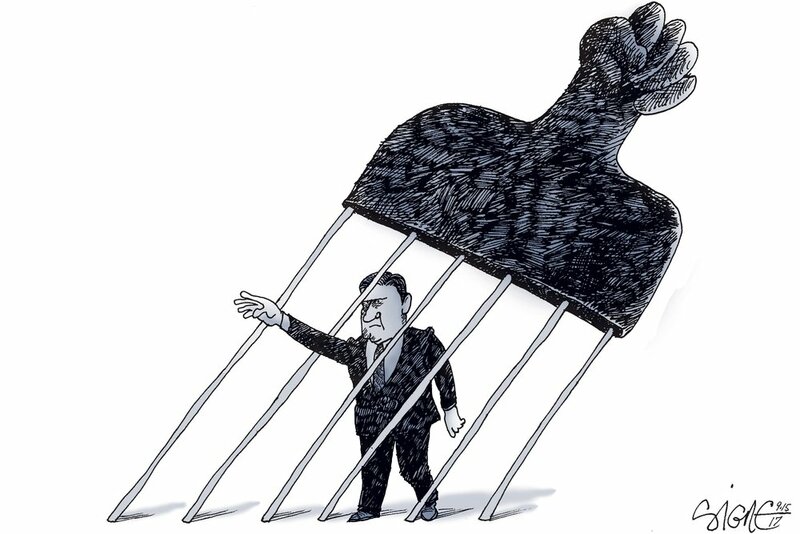 The clenched black fist comb in particular is associated with the 1970s Black Power Movement. As an accessory of a hairstyle, it represented counterculture and civil rights during one of the most important eras of American history. It exists today as many things to different people; it is worn as adornment, a political emblem, and signature of collective identity. The Afro pick continues to develop itself as a testament to innovation. This piece serves to highlight ideas related to community, strength, perseverance, comradeship, and resistance to oppression. Hank Willis Thomas is a photo conceptual artist working primarily with themes related to identity, history, and popular culture. Thomas’ monograph, Pitch Blackness, was published by Aperture. He has exhibited throughout the US and abroad including, The International Center of Photography, Public Art Fund, The Guggenheim Museum Bilbao, Studio Museum in Harlem, Musée du quai Branly, and the Cleveland Museum of Art among others. Thomas’ work is in numerous public collections including The Museum of Modern Art New York, The Solomon R. Guggenheim Museum, The Whitney Museum of American Art, The Brooklyn Museum, The High Museum of Art and the National Gallery of Art in Washington, DC. Collaborative projects include Question Bridge: Black Males and In Search Of The Truth, Cause Collective. In 2015 Thomas cofounded For Freedoms, the first artist-run super PAC. Thomas is a member of the Public Design Commission for the City of New York. He received a BFA in Photography and Africana studies from New York University and his MFA/MA in Photography and Visual Criticism from the California College of Arts. Thomas is represented by Jack Shainman Gallery in New York City and Goodman Gallery in South Africa.